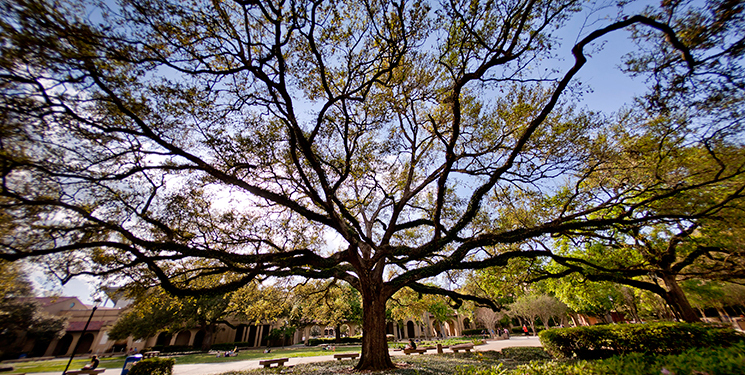 LSU Oak, photographed by Jim Zietz. Throughout his life, John Staples was passionate about his many connections to LSU. “Once he gets in it, they’re stuck with him,” his wife, Jane, said of her late husband’s sense of dedication. The Staples’ sons, Doug and Bowman, recently honored their father’s memory with one more long-lasting connection. John came to LSU to study education and history in the early 1940s. He received his bachelor’s degree in 1948 and his master’s degree in 1951. During John’s time at the university, his uncle, the late Professor Charles Henry Staples, became a mentor to him. Charles, a former head of LSU’s Department of Dairy Science, served such an integral role in John’s life that he established the Professor Charles Henry Staples Scholarship to honor his uncle. The scholarship was funded by a lifetime of quarterly donations from John. While at LSU, John joined Kappa Sigma fraternity, for which he served as chapter president. Years after graduating, he continued his commitment to the fraternity by serving in a national position. John was also a member of the 1942 ROTC class that was called to fight in World War II; he was later called to serve again, this time in the Korean War. Back home, he became involved with the Cadets of the Ole War Skule, a group of men and women who celebrate the university’s rich military history and traditions. The group, founded in 1955 by several cadets, strives to preserve and strengthen a spirit of camaraderie among its members, to foster and perpetuate patriotism, to strengthen a sense of individual allegiance to LSU, and to promote public awareness of the value of LSU’s military contributions. John’s passion for LSU and the campus community extended beyond the gates of the university’s core. For 60 years, he frequented campus as a member of University United Methodist Church, and as an LSU football season ticket-holder. “It’s just another one of those things where he was locked in tight to the university,” Doug said. As a tribute to their father’s lifelong dedication to LSU, Doug and Bowman gave John a permanent LSU connection by endowing an oak outside of the military science building. They and their family previously endowed an oak in memory of Doug and Bowman’s brother, David. The Endow an Oak program was introduced in 1993 to improve the poor health of the then-underfunded live oaks across campus. Fifty percent of each gift builds the oak endowment, and the other half can be used immediately by LSU’s arborists.